The 210mm handle is wide compared to most floor pumps. The clamp to the pump’s plunger is 31.8mm (feel free to substitute in your favorite bars). The New Belgian Ramble Ride is a three-day bikepacking adventure from Fort Collins, Colorado, to Steamboat Springs. Each day riders are provided a lunch stop and at day’s end they all camp together and enjoy New Belgian beers and a prepared dinner. The riding is difficult and participants must carry their own shelter, sleeping bag, etc. But the rewards include beautiful high-mountain scenery and the camaraderie of 100 other bikepackers. As a sponsor of the event Blackburn took the opportunity show off some new product that will hit stores this fall. Blackburn has been in the inflation business for a long time. But they were admittedly on the back foot when Bontrager’s Flash Charger hit the market. Designed with a compression chamber that a user pumps up to pressure and then releases to help seat tubeless tires, there are now many other manufacturers with similar products. Blackburn’s Chamber Tubeless was four years in development. But while they may have been off the back initially, it may have been worth the wait. I use Bontrager’s Flash Charger routinely and the feel of the Blackburn is far more robust. The base is cast steel, lending it weight and stability. The handle is super wide (by floor pump standards) at 210mm and clamps using a 31.8mm diameter. The extra-long hose is really handy for when inflating a bike in a repair stand or on your car rack. The pressure gauge uses a domed lens and Blackburn reps said they used an aircraft quality gauge for accuracy and durability. Blackburn uses an aircraft quality gauge in its new pump. The domed glass helps the numbers pop visually. When seating a new tire, Blackburn recommends pumping to 160psi to charge the compression chamber. When you flip the switch for regular pumping, a really nice feature is that your efforts bypass the compression chamber. It has a much more direct feel when topping off a tire than some other chamber style floor pumps. The pump’s head is serviceable and has a bleed valve. Bottom line, the Chamber Tubeless Floor Pump is an attractive option. And though it’s not cheap at $150, but it should work well for years to come. Blackburn’s Plugger Tubeless Repair Kit is made to be mounted for quick access. It comes with a Velcro strap, but you can also tape or zip tie it to your frame. While again not first to market, Blackburn’s take on a tubeless tire plug kit does bring a nice, quickly accessible mount to the party. 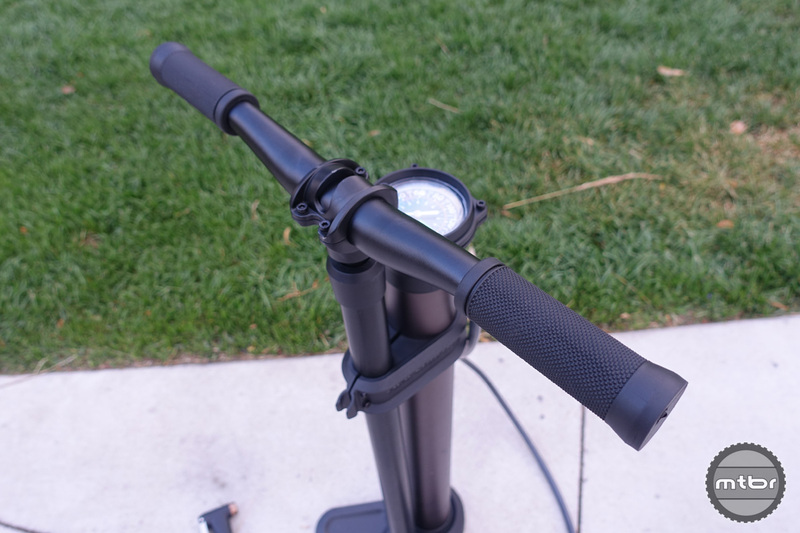 It is made to be mounted directly to your frame or seatpost so that you can access it fast enough to actually retain some of your tire’s pressure. Blackburn recommends strapping, taping, or zip tying it to your top tube. You can preload the insertion device with a “jerky” plug and store it that way. In the handle, the Plugger arrives with 10 extra “jerky strips.” For larger holes, you can twist multiple plugs together. Your tubeless sealant will do the rest. In many cases you may need to add air, but this is still far faster than removing your wheel and tire and putting in a tube. Digital tire pressure gauges are great for anyone racing cyclocross, riding fat or plus bikes, or anyone who likes to accurately experiment with tire pressures. 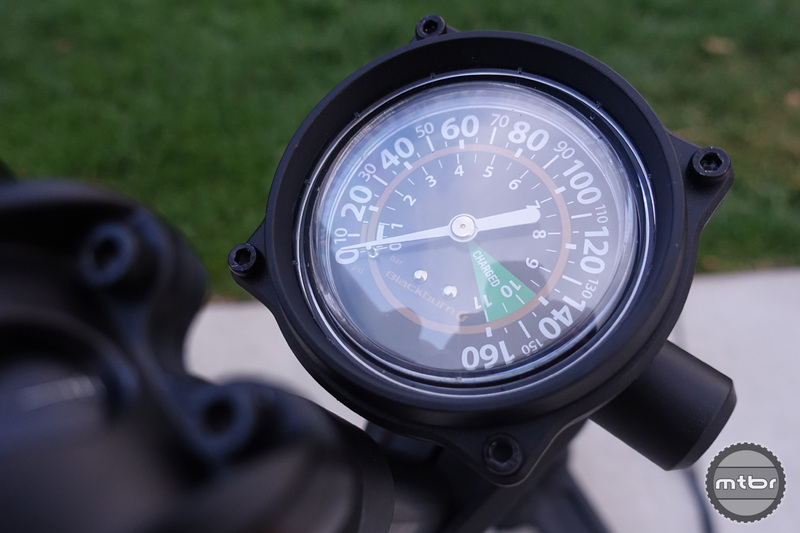 For riders who like to precisely experiment with tire pressures, Blackburn’s new Honest Pressure Gauge is right up your alley. 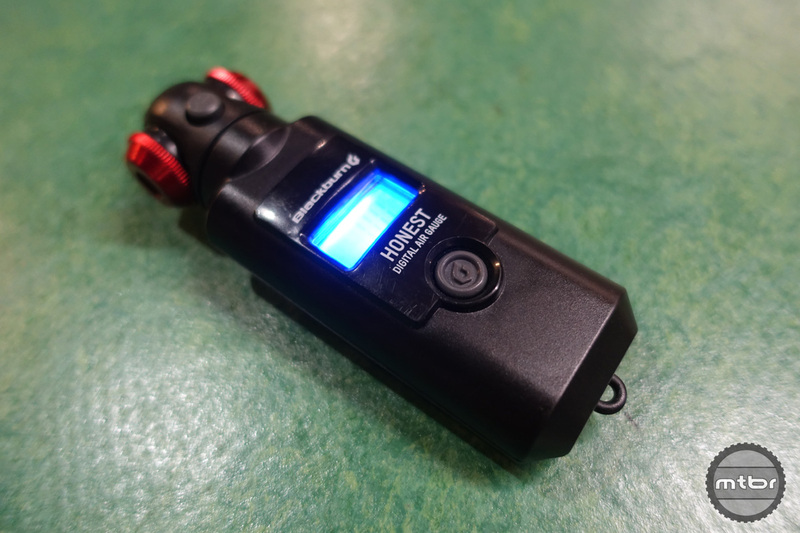 With a digital backlit display, swivel Schrader/Presta head and long life thanks to two 2032 batteries, the gauge is packed with smart features. Blackburn claims that it is accurate down to 1 psi and measures in 0.1-psi increments. The low profile head makes accessing short valves easier and it has a bleed valve for letting off small amounts of pressure. The gauge feels nice in the hand and comparing its reading against the gauge on the Chamber Tubeless Floor Pump showed very similar readings in the 30 psi range. 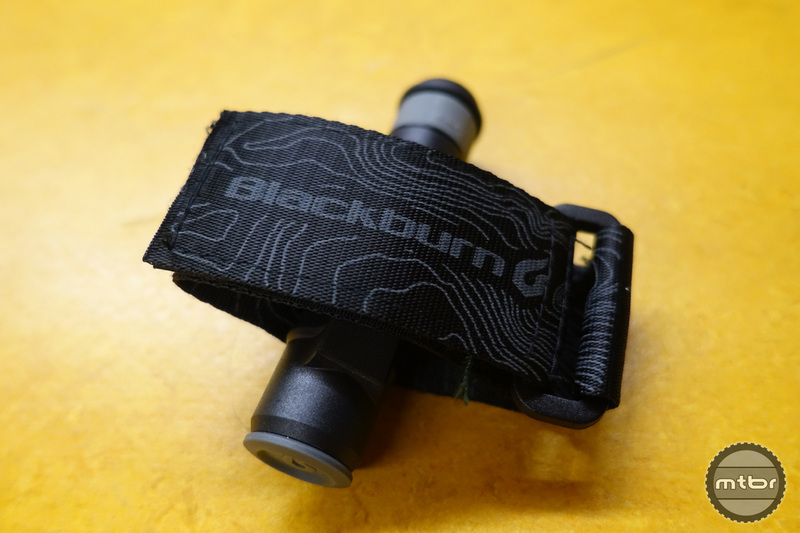 Blackburn’s new Countdown headlight packs 1600 lumens in its brightest mode. Blackburn continues to up its illumination game and the Countdown 1600 Headlight is the company’s first true offroad light. Intended for mounting on a handlebar it has several features that will appeal to mountain bikers, but also commuters. The Countdown has six modes (Blitz, High, Medium, Low, Strobe, and Pulse) and the display shows current mode and real time battery life displayed in hours/minutes. Three buttons allow you to turn the light on/off and scroll quickly between modes. Tap the power button once and it cranks up directly to Blitz mode, especially handy when cresting a hill to begin a descent. Tap it again to return to previous mode. Clever. Commuters will appreciate the light’s side visibility and all users will like the narrow handlebar mount. 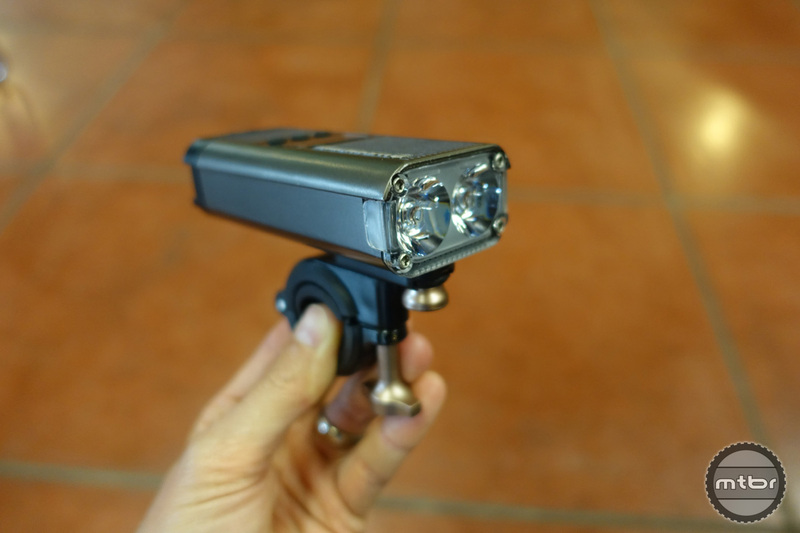 The light arrives with three spacers to accommodate 35, 31.8 and 25.4mm handlebars. The mount is attached via a thumb screw and a small quick release secures the light to the bar mount. The display on the Countdown shows both mode and battery life remaining in hours and minutes. The arrow buttons allow you to quickly access all six modes. The light is IP67 waterproof, meaning you can actually submerge the light in up to one meter of water and it’ll still work. The USB rechargeable light goes from empty to topped off in under three hours. At around 250 grams it is a bit heavier than you’d consider for a helmet light, but as intended it looks like a nice bar-mounted light. 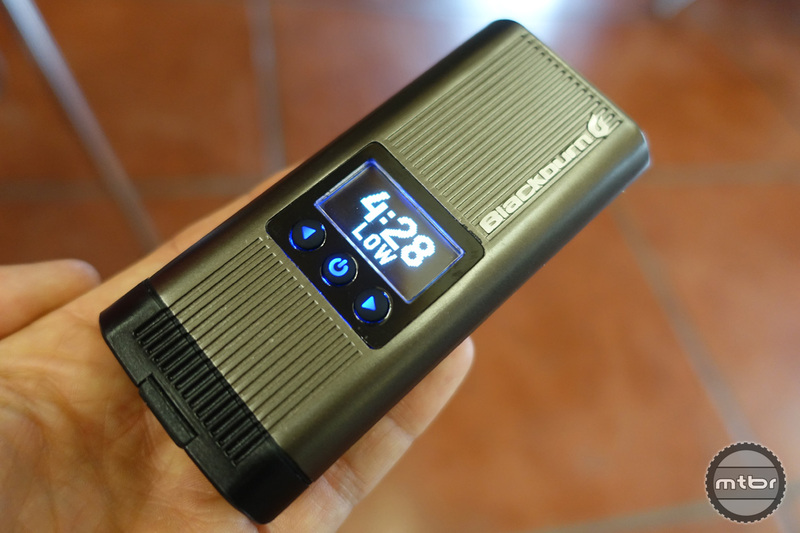 And the peace of mind that comes with knowing exactly how long your battery is going to last in hours and minutes versus green/yellow/red LEDs or a percentage of battery left can’t be beat. To learn more head to www.blackburndesign.com. Blackburn uses an aircraft quality gauge in its new pump. The domed glass does help the numbers pop visually. The handle is wide compared to most floor pumps at 210mm. The clamp to the pump’s plunger is 31.8mm. So feel free to substitute your favorite bar. 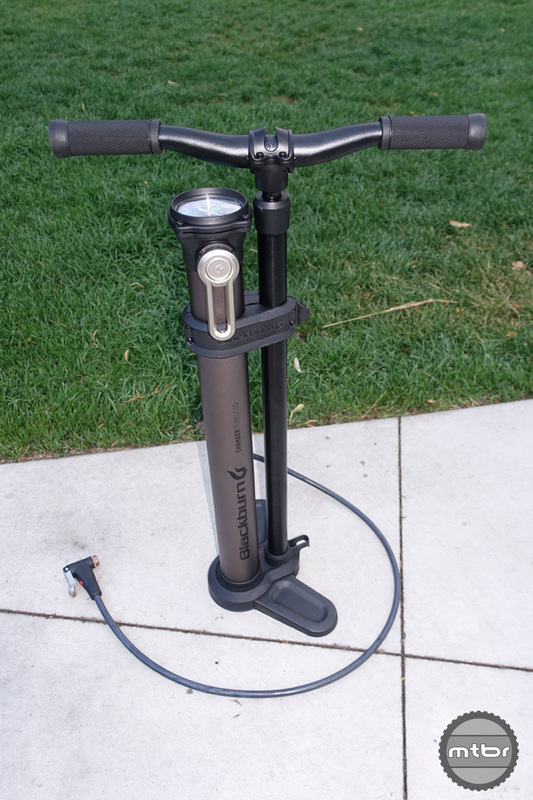 Blackburn’s new Chamber Tubeless Floor Pump is a sturdy tool for setting up tubeless tires and everyday inflation needs. The silver handle switches between “Chamber” and “Pump/Release” modes. 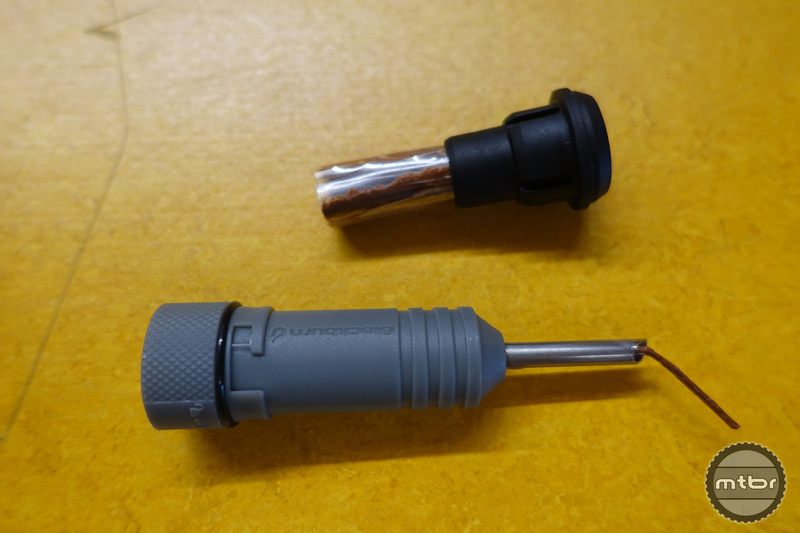 Blackburn’s Plugger Tubeless Repair Kit is made to be mounted for quick access. It comes with the shown Velcro strap, but you can also tape or zip tie it to your frame. Digital tire pressure gauges are great for anyone racing cyclocross, riding fat or plus bikes or anyone who likes to accurately experiment with tire pressures. One thing I hate about high pressure gauges and MTB tires is that I only need the first few degrees of display and fine tuning is impossible. Ugg this pump is no exception.